Flautist currently in final year studying for BMus (Hons) at the University of Chichester. I have received tuition and attended masterclasses with Emily Beynon, Ian Clarke, Gitte Marcusson, Stewart McIlwham, Susan Milan and Sarah DeBats. I have played for a number of ensembles, including the county orchestra from my home town. I am passionate about music as a form of education, for enjoyment and am keen to share that passion, encourage and inspire students who wish to learn to play the flute. I have worked with young people in an ensemble environment and on a one to one basis. I adjust my techniques to suit the individual. VictoriaFrom Zara (5/5): Victoria is friendly and personable, well presented and punctual. The first lesson went very well, we looked at posture and first steps to playing a flute. The lesson was informative and geared to my beginner /intermediate level. We covered several points, the lesson was good value for money! Victoria is very encouraging which is fantastic. My only real critisism, if I had to be constructive to help Victoria develop as a serious teacher of music is to look abit smarter because it does have bearing on the lesson. I enjoyed the lesson and it helped me to make good progress. 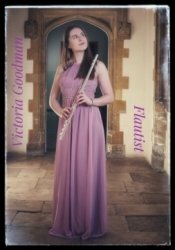 Well done!☺ I think Victoria has a lot to teach as regards the flute, and also general musicianship.